The final antenna for the Atacama Large Millimeter/submillimeter Array (ALMA) in Chile is delivered on Sept. 30, 2013. A giant radio telescope in Chile has received the last piece of its 66-antenna array, a special delivery that will help the observatory peer into deep space better than ever. The antenna was delivered Monday (Sept. 30) to the Atacama Large Millimeter/submillimeter Array (ALMA), and is expected to be installed by the end of the year. ALMA has been in operation for years, adding antennas as it goes. With this last antenna one — No. 66 of the dozens provided by Europe, North America and Asia — the telescope will reach its maximum sensitivity. You can see a video of ALMA's last radio antenna delivery here. The final antenna for the Atacama Large Millimeter/submillimeter Array (ALMA) in Chile just before its delivery on Sept. 30, 2013. "This is an important milestone in a project that has already expanded our understanding of the universe," Phil Jewell, the North American ALMA project director, said in a statement. 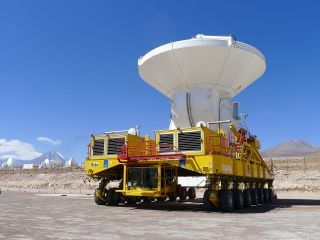 "Since the delivery of the first antenna in 2009, ALMA has enabled unprecedented research and made startling discoveries. The international scientific community eagerly awaits the new capabilities ALMA will provide now that it is reaching its full potential." The giant ALMA radio telescope officially opened for business in March, when all major systems were put online and the heaviest phase of construction finished. When complete, the radio telescope array will stretch across nearly 10 miles (16 kilometers) of Chile's Atacama Desert. The $1.3 billion ALMA telescope is an international project managed jointly by the European Southern Observatory, the National Radio Astronomy Observatory and the National Astronomical Observatory of Japan and is by far the largest instrument capable of making observations in the submillimeter wavelength. Submillimeter astronomy uses wavelengths that are longer than radio waves, but shorter than visible light. It allows astronomers to peer through dust to see stars and planets being born, among other phenomena. ALMA's huge antennas pick up sky signals individually. A supercomputer then combines their observations and calculates the signals' direction, similar to how humans use their two ears to pinpoint the location of the sound. ALMA has already made many astronomical discoveries despite its uncompleted state. These include spotting a monster baby star that is still growing, taking a closer look at old star-forming galaxies, and spying on a previously unseen stage of planet birth. Editor's Note: This story was updated on Oct. 4 at 10:07 a.m. EDT (1407 GMT) to reflect a correction. ALMA is an international project jointly managed by NRAO, ESO and NAOJ not just ESO as the article previously stated.